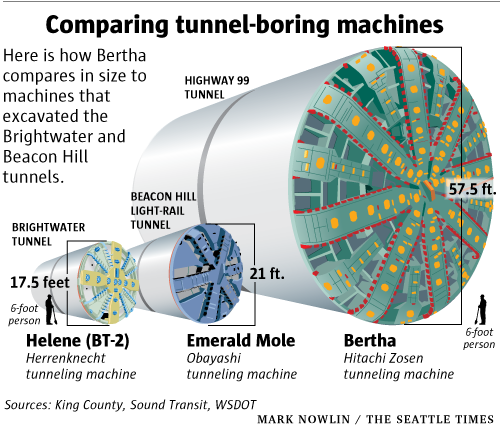 “Bertha,” the mammoth Highway 99 tunnel drilling machine, arrived in Seattle on Tuesday from Japan. The ship may dock Wednesday at Terminal 46, where 41 pieces, weighing 6,700 tons, will be unloaded over two weeks. Container ships take priority, so the ship likely will move on and offshore. The green disk on the ship’s deck is the rotary cutter head, the world’s largest at 57½ feet in diameter. The sections will be moved to the construction zone on flatbed trucks with up to 96 axles and 768 tires. The drill will be assembled in a Sodo pit, where this summer it will begin the two-mile route to South Lake Union. Drilling should be done late next year. The $2 billion, four-lane tunnel is scheduled to open to traffic at the start of 2016. Toll rates are not yet set. Read more about the tunnel machine, courtesy of the state Department of Transportation, watch webcams and learn and the project to replace the Alaskan Way Viaduct. View pictures of the big tunnel digger at http://seati.ms/12cBzD9.